Find the perfect family home in the Woodcroft real estate listings below! This picturesque community in Durham primarily consists of single-family homes, but you'll also find some charming townhomes and condominiums in the mix as well. Homes for sale in this community are set along idyllic streets that are surrounded by a dense cushion of biodiverse trees and shrubs. Whether you're looking to buy your very first home or are thinking about moving into a welcoming suburban neighborhood, there's something for every buyer in here. View all of the current homes for sale below or keep reading to learn more about Woodcroft homes for sale and nearby lifestyle amenities. Woodcroft homes for sale are mostly a mix of traditional and colonial revival homes, many of which were developed in the mid-to-late 1980s and 1990s. Houses in Woodcroft are typically bi-level and feature nine-foot ceilings, spacious kitchens, private backyards, a multi-car garage, and well-maintained frontages with healthy green lawns. While each home is completely different from the next, they'll often showcase beautifully renovated spaces that have been finished with contemporary elements and fixtures. This master-planned community has been thoughtfully designed to harmoniously unite a thriving suburban community, without encroaching on the natural habitat. As a result, you'll find a number of beautiful native plant and trees species thriving along the roadsides of these traffic-calmed neighborhoods. It also adds a great sense of comfortable privacy between the lots and helps to buffer noise from the nearby interstate. On top of it's stunning scenery and modest houses, homes for sale in Woodcroft boast exceptional affordability. While many of the homes in this area are owner-occupied, it's great access to arterial roadways, neighborhood features, and nearby amenities, could make it a great place to consider buying an investment home. To learn more, check out our latest blog post about the Woodcroft real estate market. Escape from the hustle and bustle of city living and get back to nature in Woodcroft. The community features over six miles of paved, pedestrian and bike-friendly trails with enhanced safety features at road crossings. The Woodcroft Trail intersects throughout the neighborhood and is a great destination for a post-work run or after-dinner walk. Other popular trails include the American Tobacco Trail and Third Fork Creek Trail, both of which offer a healthy and scenic alternative for your commute to work or school. This community is just 17 minutes to downtown, 15 minutes to Duke University, and 12 minutes to North Carolina Central University. 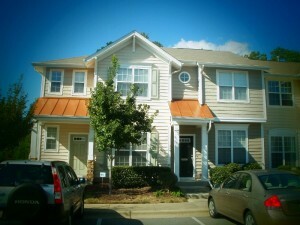 Woodcroft is also close to Southpoint Mall, the Raleigh-Durham International Airport, and the Research Triangle Park. Woodcroft also has a very active community association that's great for keeping you informed about new bylaws and restrictions as well as fun, family-friendly events and activities. To learn more about Woodcroft real estate and to request a showing, contact the team at My NC Homes today! Send them a message online or give them a call at 919-659-6173.